I've been doing a lot of experimenting in the kitchen this year in an effort to branch out with my cooking and try new things. I am crafty with many things but culinary art is not one of my talents. Since we are trying to eat healthier, eat local foods, and cut out processed "foods" as much as possible I have been cooking from scratch almost nightly, about 6 days a week. It has been a fun learning experience so far! Tonight's dinner was exceptionally yummy so I figured I'd share the recipe I found via pinterest. The original recipe is found here. Earthfare had a great deal on wild-caught Mahi Mahi this week so we picked up a couple pounds. We actually don't eat a lot of fish simply b/c I'm not a huge fish person...but like I said, I am branching out. Remember the portobello mushroom revelation from my Valentines Day dinner? Well, same thing happened tonight. I normally don't really like fish but this was delicious!! Super easy too! I guess the saying is true...Mahi Mahi, the fish so nice they named it twice!! Combine spices and rub onto both sides of your Mahi Mahi (including skin side). Add butter to a cast iron grill pan on med to med-hi heat. Once butter melts and sizzles add your Mahi filets skin side down. Cook both sides about 4-5 min each until meat is flaky. The skin pulled away from the fish once mine was cooked through. 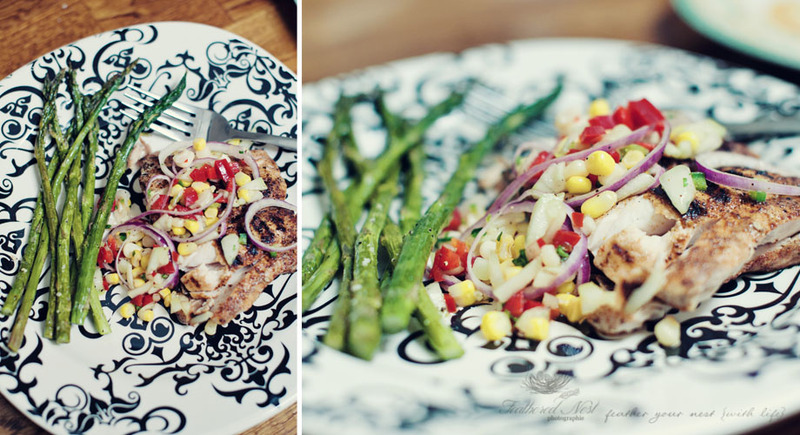 Mix all ingredients in a bowl and allow to sit for 20 minutes so flavors can mingle and get to know each other :) Spoon slaw onto cooked Mahi and admire the prettiness! Then enjoy!! Line asparagus in a single layer on a baking sheet. Drizzle with olive oil and sprinkle with kosher salt and pepper. Bake at 425 for 20-22 min until they start to brown. If you have really thick asparagus you may need to blanch them prior to roasting so that they will cook entirely. Roasted asparagus is a staple in our home and is absolutely delicious! !